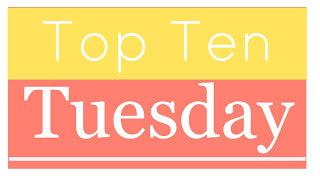 My Top 15 Reads Of '15! I always love/hate doing these end-of-the-year best reads lists, as it's very difficult to pick favorites...especially this year because it's been the first time I've read over 250 books! But, after looking back over what I've read, there are some clear standout favorites for me. WHAT ARE YOUR FAVORITE READS OF 2015?? LOVED the first book in this series! Lucy knows she must unlock those missing months and discover why she threw everything away. And Zac knows that if he follows his heart he’ll win back the love of his life—but if Lucy’s memory returns, his would-be bride will say good-bye forever. Loved Dani's Alaskan Courage series. 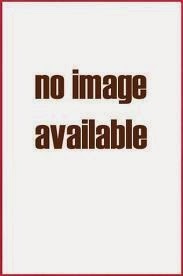 Can't wait to read this new series! Four Best Friends. And Then One Went Missing . . . The latest Porter Family novel. Can't wait to read Dru's story! Even though I have to still read Always on My Mind and The Wonder of You, I know I'm going to want to read this book ASAP, as I loved the books I've read in this series. For plucky Lillian Avery, America's entry into World War II means a chance to prove herself as a pharmacist in Boston. The challenges of her new job energize her. But society boy Ensign Archer Vandenberg's attentions only annoy--even if he is her brother's best friend. After a fierce battle with Draewulf, Nym barely escaped with her life. Now, fleeing the scorched landscape of Tulla, her storm-summoning abilities are returning; only . . . the dark power is still inside her. Broken and bloodied, Nym needs time to recover, but when the full scope of the shapeshifter’s horrific plot is revealed, the strong-willed Elemental must race across the Hidden Lands and warn the other kingdoms before Draewulf’s final attack. From the crystalline palaces of Cashlin to the legendary Valley of Origin, Nym scrambles to gather an army. But even if she can, will she be able to uncover the secret to defeating Draewulf that has eluded her people for generations? With a legion of monsters approaching, and the Hidden Lands standing on the brink of destruction, the stage is set for a battle that will decide the fate of the world. This time, will the Siren’s Song have the power to save it? That's my Top Ten "Most Anticipated Releases For The First Half of 2016". Please share your list and comments below! Clean Out Your E-reads Challenge (#COYER) -- Sign-up & Progress! This challenge started a little over a week ago and I completely missed signing up for it...until now! 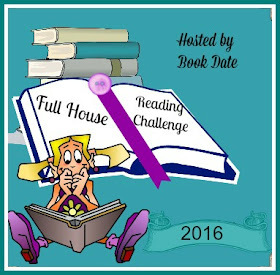 I had so much fun last year participating and I can't wait to get started "cleaning out my e-reads" again! ;) Since the challenge already started, I'm going to include any books I finished since the 19th that work. Check out the rules and sign-up on the Because Reading site. 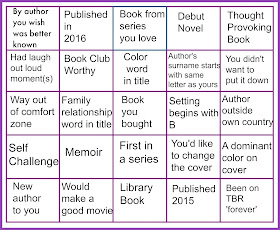 After taking a somewhat break from blog reading challenges in 2015 (only participated in the 2015 TBR Pile Challenge), I am going to do several in 2016! I came across these and they sound super fun, so I'm hoping I can complete them. "Complete the card below. You can do it in any order you wish. You are allowed "one free exchange", if there is something on the square you really dislike you may change it to something of your choice. Once you have played this free choice that is it. Mention the exchange in the final summary post." For the "Self Challenge" square, I'm going to challenge myself to "Read a book that's over 500 pages". Also participating in this NetGalley Reading Challenge. Going to go with the highest level. "The Blogger Shame Review Challenge--cohosted by herding cats & burning soup and Addicted to Happily Ever After-- is all about dusting off all of those forgotten review books and making them happen!" I'll be tracking my progress HERE. Will try to keep that page updated monthly. Are you participating in any reading challenges next year? Please share below!